Tonight: Increasing clouds. Lows in the mid 50s. Sunday: Mostly cloudy. Showers. Highs in the mid 60s. Monday: Mainly cloudy. Cool. Highs around 60. With nearly 200 reports of severe wind gusts with thunderstorms Friday evening and night, utility crews will likely be spending the remainder of the weekend making repairs to lines in Vermont and New Hampshire. Gusty winds have relaxed, though, and the remainder of our Saturday is nearly perfect - sunny, low humidity and warm. Our weather takes a turn overnight, however. Sunday will be mostly cloudy with a few showers around. It appears we will miss a batch of locally heavy rain, which will stay offshore. Showers will be possible through Sunday night. Even with the unsettled weather around, we should still see a few sunny breaks. Temperatures will reach the mid 60s. Monday will be rather cool with high temperatures ranging from the upper 50s to the low 60s. Much of Monday will be dry, but clouds will remain in place. Tuesday, we will clear out and turn warmer. 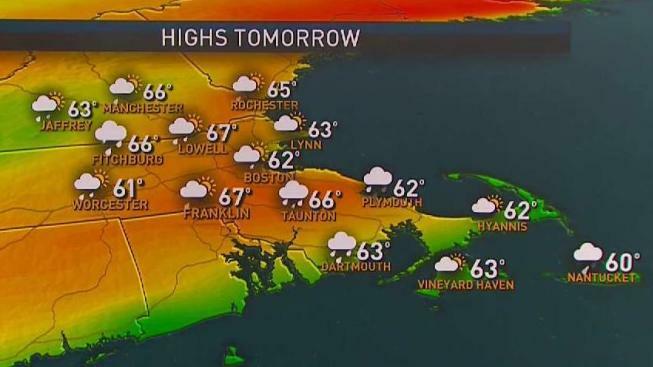 High temperatures will once again reach the middle 60s. Both Wednesday and Thursday look amazing. High pressure will bring sunny skies both days with temperatures ranging from the mid 60s to low 70s. We stay dry through the day on Thursday. Friday will be mild, but showers will return to the forecast. Temperatures for the following weekend will remain steady.